Welcome to the Tennessee Supreme Court Historical Society! 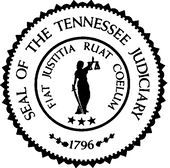 In October of 1995, our founders created the Tennessee Supreme Court Historical Society because they had a genuine interest in ensuring the records and history of the Tennessee Supreme Court and the other courts of Tennessee were not only preserved but also accessible to the citizens of our State. In addition, the founders wanted to educate Tennesseans of all ages about the rule of law and the vital importance of an independent judiciary in ensuring appropriate checks and balances in our form of government. Since its inception, the Society has embarked on many ambitious projects. But of course, it has not been all work and no play. We have also enjoyed many fun events in which we have honored retiring and incoming Justices of the Tennessee Supreme Court, retired U.S. Supreme Court Justice Sandra Day O'Connor, Governor Phil Bredesen and others. The Board of Directors is grateful for your interest in the Society, and we hope you will consider supporting our work by becoming a member or by making a financial donation.